Wrap Cup Masters Series London. Mimaki is a Premium/Platinum sponsor of this event. One of FESPA’s most animated and exciting features, the FESPA Wrap Cup Masters Series will again take place during the event, featuring a host of vehicle wrapping superstars. Numerous contestants will battle it out through several rounds across three exciting days, to be crowned the FESPA Wrap Cup Masters Champion. 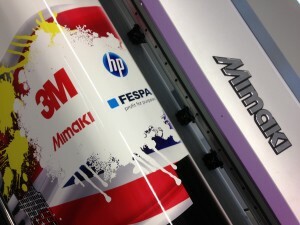 The Mimaki JV400LX printer will be the star printer producing these wraps. Promotional Product Business Academy (PPBA). Mimaki is a PPBA partner and co-organizer of this important activity, designed to showcase the range of garments and promotional products available to printers who are looking for additional revenue streams and to expand their businesses. Printers will learn how easy it is to print and/or personalize garments and promotional products for a value-added customer experience through case studies of successful practitioners. In addition, visitors will also be able to collect a complimentary one-month subscription to europeansourcing.com, an online hub for traders in the promotional product arena. The Mimaki UJF-3042HG is amongst one of the selected printers for the production of these promotional products.